Learners Show Off their talent! 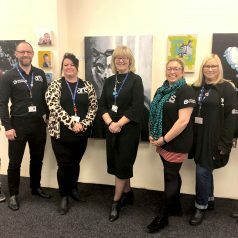 Staff and learners from the Grimsby Institute’s, Grimsby School of Art, officially opened the doors to their exhibition, Show Offs, which is being held in Freshney Place this week. The exhibition which is open to the public from the 18th – 22nd February includes; fashion, photography, performing arts, moving image and visual arts. “I absolutely love that the art department want to showcase their work outside the college, I think it’s really important that we engage with the public and show them what we do. The work is so impressive, when you walk in to the exhibition you think wow, this is really world class. “Show Offs is a wonderful opportunity for our learners to showcase and get public response to their work at this mid-way point in their course. This exhibition is important for our learners in preparing them for their final exhibition in June. “We do some great work in the art centre and people don’t always see it, so this is a great way of getting art in the middle of the community and showing everyone what we do. We want to share and celebrate the great work taking place in our community.